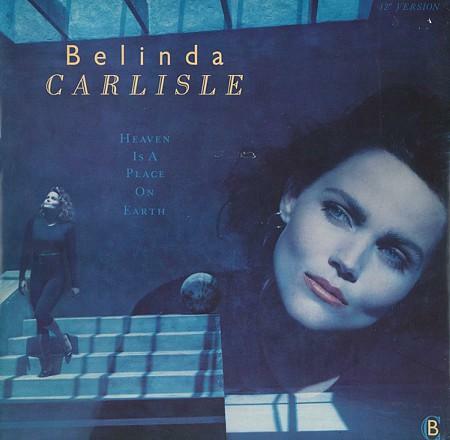 This was Belinda Carlisle's best-known and best-selling single which was released as the lead single from her second studio album Heaven On Earth. It was also the first major hit for the American singer in the UK - previously only her debut single had charted at #67. 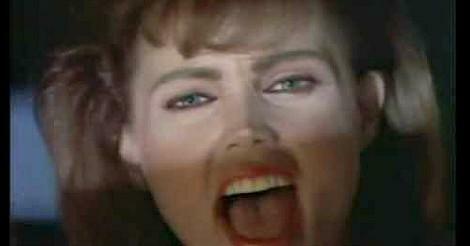 The track includes Thomas Dolby on keyboards and backing vocals by the songwriters Rick Nowels and Ellen Shipley. Vocals are also provided by Diane Warren and Michelle Phillips from The Mamas & The Papas. The B-side of the 7" and 12" vinyl singles was the track "We Can Change". The UK 12" also included the Heavenly Version of the A-side. The U.S. 12 inch featured three versions of "Heaven is a Place on Earth", the Heavenly Version, Down to Earth Dub and The Voice. A cassette single was also released which, disappointingly, featured the same tracks as the 7" vinyl on both sides. The video is quite basic (there's no storyline) and was directed by Diana Keaton, who is still working as an actress at the age of 72. It includes an appearance of Belinda's husband Morgan Mason (the son of actor James Mason) who she married in 1986. He had previously appeared in her debut single "Mad About You" which was a No.3 hit in the States. Part of the video was shot at the Six Flags Magic Mountain theme park in Valencia, California. It starts with a group of children wearing burglar masks and holding illuminated globes. We then see Belinda dancing and also the globes placed in a triangle. Not a great deal happens after this, and the video alternates between the kids with globes, Belinda dancing and in the arms of her husband. There are a few different backgrounds and 80s style effects thrown in but it all looks fairly minimalist. Nonetheless, it gave the singer a stylish new look which was very different to her time with the Go-Gos. The single entered the UK singles chart at #43 on 6th Dec 1987 while T'Pau were at No.1 with "China In Your Hand". It reached #1 on Jan 10th 1988, pushing Pet Shop Boys down to #2 with their Elvis cover "Always On My Mind". The single remained at #2 for two weeks before dropping to #2 on Jan 24th, with Tiffany claiming the No.1 spot with "I Think We're Alone Now". "Heaven is a Place On Earth" also reached #1 in the U.S. on 5th Dec 1987. It also topped the charts in Ireland, Sweden, Switzerland, Norway and South Africa. Belinda recorded a new version of "Heaven is a Place on Earth" for her album "Wilder Shores" in September 2017, although it was a pretty much a commercial flop. However, the entire album was sung in Gurmukhi and was very different to her 80s and 90s pop albums. Her 2007 album "Voila" was sung in French.